Yes, I know stove top beef stew can be made in a slow cooker and it’s easier. :p Truth be told though, I am having a hard time finding a slow cooker that I really like. I don’t like the ones with the ceramic lining because they are too heavy and hurt my back. And the ones made out of the substantially lighter aluminum liner are always coated with a non-stick coating which I avoid like the plague. What I really want is a stainless steel lined slow cooker. The only thing I have found that is close to what I want, is the instant pot. But I’m hesitant to buy it, because it’s a pressure cooker, and I’ve seen reviews where some of them have burned holes in themselves. So for now, I will stick to the stove top :). 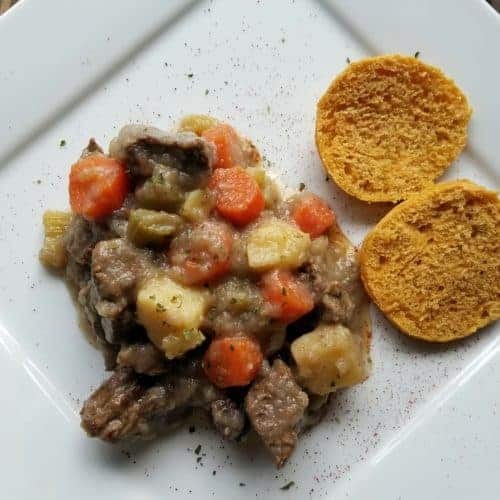 I was really craving some beef stew for the upcoming winter storm here in NY, and I came across a version by Paula Deen that looked like something I could work with and make a few modifications to. The result is a thick, chunky stew with tender vegetables and juicy hunks of browned beef. The stew pairs very well with my sweet potato biscuits. 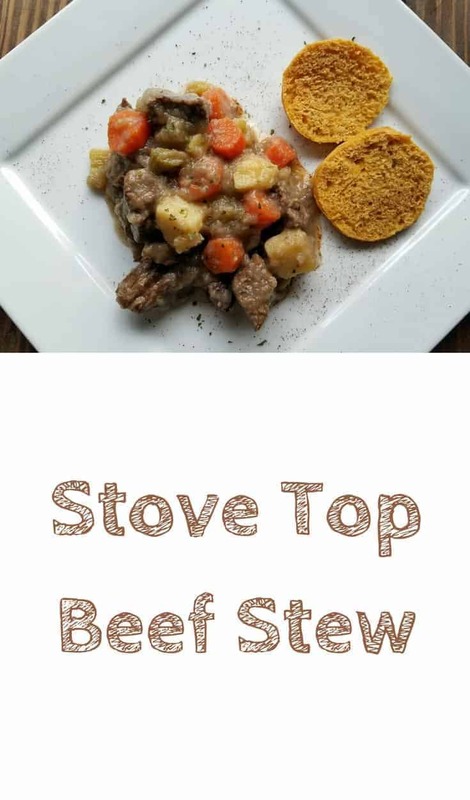 This stove top beef stew is a winner in my book, and perfect for the cold winter nights up ahead! This stove top beef stew is perfect for those cold, wintry nights. Pair with a roll or a biscuit, and you've got yourself a satisfying, hearty meal! Heat oil over medium-high heat until it starts to shimmer. Add meat and brown in batches. Add water, garlic, bay leaves, onion, brown sugar, salt, pepper, paprika, and allspice. Cover and simmer for 1 1/2 hours. Remove bay leaves and garlic, discard. Add carrots, potatoes, and celery. Cover and simmer 30-40 minutes longer. To thicken, remove 2 cups of hot liquid. Using a separate bowl, mix corn starch with 1/4 cup of liquid. Pour this mixture into the rest of the hot liquid and mix together. Finally, pour the entire mixture back into the pot and stir. Increase heat to medium-high and bring mixture to a boil. Let it boil for 3 minutes, stirring frequently, to thicken the mixture. Serve with some sweet potato biscuits or regular dinner rolls and enjoy! Credit: Recipe lightly adapted from Paula Deen. Oh my the beef stew looks delicious. I am such a big fan of beef. Have you tried Bresaola , that is beef in its finest form. Thanks for the recipe. I love beef stew and I always make it in my slow cooker. I will try your recipe soon. I can’t believe its been a while since I made beef stew. Can’t wait to enjoy a hearty dinner! 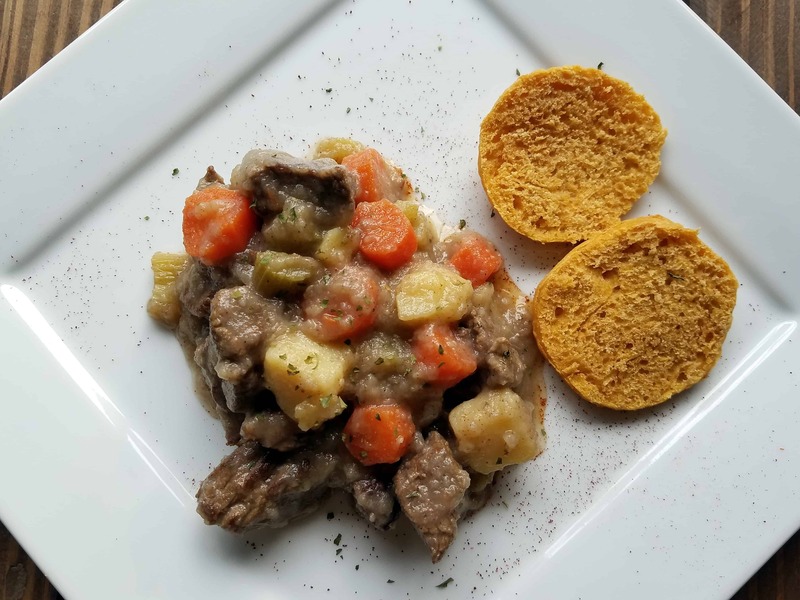 Love your delicious, chunky, beef stew recipe! The sweet potato biscuits look fantastic too. I am going to make some soon. I will try making it on the stove. I guess it turns out more flavorful that way. Honestly you can not beat a good stew and a beef one at the has always been my go to comfort dish.